This year I decided to start eliminating products from my life that were not cruelty free. As a result, I have found a lot of new products that I love. Below are the top products that I found that, if I haven’t already, I will be repurchasing in the future. My number 1 find of this year is probably the Herbavore Coco Rose body polish. I talked about this in my Skincare Empties post. I had tried the sample size in a set that I purchased but I did buy the full size version. My skin loves this product. It exfoliates my skin without drying it our or causing irritation. In fact, it takes away a lot of the redness that my skin gets. Also, who doesn’t love this pretty pink? Another produce that I love (and have already repurchased) is the Tula Illuminating Serum. This was a product I discovered towards the end of the year and I just love it. The Tula website describes it as a serum used to target dark spots, hyperpigmentation, and dull skin. I have always had difficulty with dark spots and redness in my skin. While this hasn’t made every single spot disappear, the redness of my skin has dropped significantly. I even had family members comment on the glow of my skin at Thanksgiving! If you need a new serum, I highly recommend this. And not just because I love their blue packaging. Staying in the Tula category, another find that I’ve been enjoying is their Multi-Spectrum Eye Renewal Serum. This is a serum that is caffeine infused and is meant to reduce the appearance of wrinkles and puffiness as well as hydrate. I have been using this every night before bed and the packaging makes it relaxing to spread around my eyes. I immediately feel some tightness after application and in the morning I feel like I look more awake than on the nights when I don’t use it. I also appreciate that it’s not ridiculously expensive for an eye cream. You only need one pump for both eyes, so I think it will last a while. For moisturizing, I found and loved the Tatcha Water Cream. Yet another product with glorious luxe packaging, the product inside is just as luxurious. It’s a little pricey for a moisturizer, especially since it doesn’t have an SPF. Although, I haven’t found many SPF skincare products that are also cruelty-free. This product is oil-free and is said to provide optimal hydration, tighten pores, and smooth skin texture. I don’t know if I noticed it tightening my pores, but my skin did drink this product up. And even though it’s expensive, it does last a long time since a little goes a long way. Another product that I had mentioned in my Skincare Empties post that I have loved is the Korres Greek Yoghurt Foaming Cream Cleanser. I honestly didn’t expect much from this cleanser. It’s been a while since I have found a cleanser that I have loved enough to purchase the full size. I get a lot of samples of cleansers and while they all so the job, that’s kind of all they do. This was the first cleanser I’ve used in a while that I saw significant improvements on my skin. I always get hormonal breakouts and this even helped lessen those! Finally, the last skincare product that I found this year are the Lapcos sheet masks which I previously reviewed here. I wasn’t crazy about sheet masks before finding these. I love that they offer a variety pack because I enjoy so many of these masks that I couldn’t choose just one. I love using the various moisturizing and soothing ones after travel because airplanes do a number on your skin. I find these to do just what they say they will and they actually fit pretty decently on my face. Every year Jamie from Perpetual Page Turner puts out this end of year book survey. I haven’t filled it out the last few years, but felt up to the challenge this year. I know I’ve been a bit MIA the back half of this year, but I’m hoping to be more consistent again next year. I hope you enjoy this survey and have a Happy New Year! Because I’m terrible at picking just one book, I have three that were my favorites. The first was How to Walk Away by Katherine Center, next was Always Never Yours by Emily Wibberley & Austin Siegemund-Broka, and Josh and Hazel’s Guide to Not Dating. By the Book by Julia Sonneborn. This was the first book I read this year and I had requested it for review. I was really looking forward to it and it just left me feeling a little meh. Tie between Maureen Goo and Christina Lauren. I read multiple books by these authors this year after discovering them and have enjoyed each one. I kind of stayed within my comfort zone for genres this year. I don’t really have a lot of time to re-read anymore. Especially the ones that I have just read. I don’t typically highlight or remember quotes from books, so I have nothing to put here. Maybe Artemis by Andy Weir? Would it be cheating to say The Alice Network by Kate Quinn since I picked this for January’s book club? I usually stay pretty current on my reads. The only book that is a 2019 release that I have read so far is my current read, so I can’t recommend anything that I haven’t finished. I know that this post isn’t going up immediately after Black Friday, but I had a few items that were coming in the mail that I wanted to wait for. Now that I have everything in, I figured I could post my haul. Also, please excuse my outfit photo attempts. I don’t typically do flat layout for clothing so I’m no expert. Top is the eye serum, left pot is the exfoliating mask and right is the day/night cream. The first item (and possibly the one I was most excited about) is the Tula Holiday Ultimate Self-Care Kit ($148). A month or two ago I started using the Tula Illuminating Serum and fell in love with it. It has visibly reduced redness in my skin and I even had family at Thanksgiving compliment me on how glowy my skin was! Because I enjoy this product so much, I wanted to try more from the line. Tula is a probiotic based skin care company that is cruelty free and free from phthalates, parabens, propylene glycol, petrolatum, gluten, and mineral oil. They’re definitely a bit pricey but when compared to similar products, very reasonable. Plus the packaging is lush! I knew that this kit was expensive, and almost talked myself out of purchasing it, but then realized that I’ve been wanting to try the eye serum and that I’d repurchase the Illuminating serum in the future, so those two products alone equaled the value of this kit. Especially when it was an extra 25% off! Unfortunately, this kit is sold out but there are a bunch of different holiday kits, so if this brand sounds interesting to you, now is the time to check it out. I will do a more in depth review on this kit after using the products for a few days. The next few items were purchased when I was out Black Friday shopping with my mom. Our first stop was The Gap. Gap had 50% off plus an additional 10% off. I don’t know why they didn’t just say 60% off, but I’m not in advertising so? Normally I love getting sweaters from Gap, but nothing really caught my eye, so I focused on the workout gear and got three tops, one short sleeve and one long sleeve. I fell in love with the workout capris in store, talked myself out of them, and then ended up purchasing them from home later that night. They have mesh detailing on the bottom (that of course did not come up in pictures) and they are quite possibly the softest workout pants I own. Above are the backs of the two long sleeve workout tops that I got. 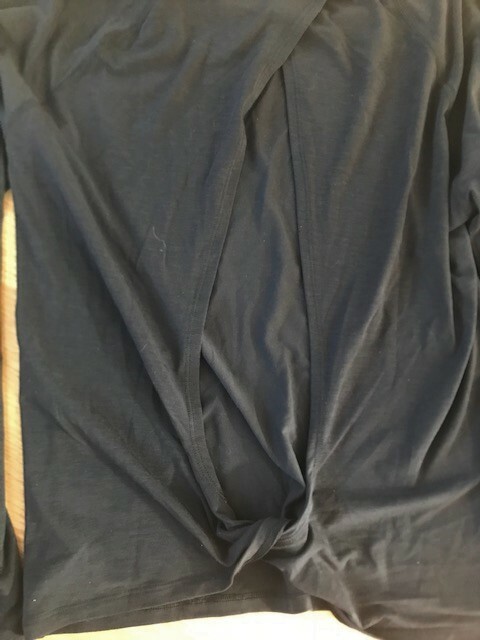 The pictures of the tops are truer to color in the first picture but I thought it would be fun for you to be able to see the backs, as they were the reason I purchased these shirts. Our next stop was Bath and Body Works. Normally, I stock up on a bunch of winter candles, but nothing really grabbed me this year other than my old standby, Winter. This is a candle I get every year and it now holds so many nice winter memories. I also picked up a Frosted Cranberry hand soap as this is another one of my yearly scents. The deal was buy 3 get 3 free on Black Friday, but Saturday was $12.95 candles plus $10 off of $30, so my mom and I actually went back on Saturday to exchange for a better deal. Definitely going to have to remember that for next year! The final pit stop we made the day of was Loft. I usually do some serious damage in this store around Black Friday because Loft has some great sweaters that I can wear for work. I did, in fact, pick up these three sweaters and am excited to add them to my wardrobe. I was also tempted by an adorable reindeer sweater but decided that since I had bought a cute polar bear sweater in a similar color last year that I couldn’t justify it. I also got a free tote bag which was an exciting bonus! I did end up returning the black and white sweater (the left one) because when I went to take the pictures for this post, I had kind of forgotten that I had bought that sweater. I figured that wasn’t a good sign, so I ultimately ended up returning it. It’s a very cute sweater and fit very well, but in the end I tend to lean more towards color and I wasn’t sure if I’d reach for it in my closet. Another online purchase that I made was this $25 sherpa hoodie from American Eagle. I own one of the Thread and Supply sherpa sweatshirts and it is one of my weekend go-tos. This one feels more like wearing a blanket. It’s the same material inside and out so it’s very warm and comfy. I also love the purple color, which may be hard to pick up on in the pictures. That’s about it for my Black Friday haul. I picked up a few items as gifts as well, but I don’t want to post anything on here, just in case. Did you make any exciting purchases on Black Friday? Between the holidays, work stress, and life stress, I haven’t been reading as much as I used to. I’ve fallen behind on my multiple challenges and have probably taken the longest amount of time to read a single book than I have in years. This isn’t an excuse for my lack of blogging, but just a bit of an explanation. I do have a Black Friday Haul post planned that I’m hoping to post on Friday and then I am also planning on doing an official update on my failed challenges. Anywho, I hope that you’re enjoying the busy holiday season and finding some good books to watch and fun Christmas movies to watch. My friends and I are admittedly obsessed with the Hallmark Christmas movies. Personally, I love the festivity, the predictability, and the all around positivity. This season we saw that there 6 (and a half) movies that were adapted from books. Since we all enjoy reading just as much as we enjoy the Hallmark movies, we decided to make a mini book club and read the books and then compare them to their movie counterparts. So, I decided to provide mini-reviews for the books, and then how it compared to the movie as well as which one I preferred. 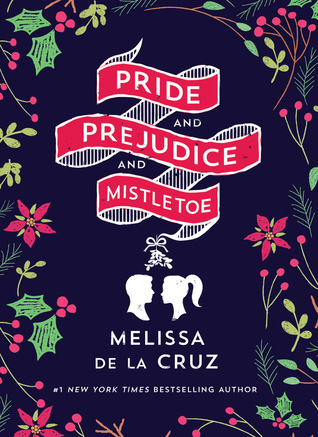 Book- This was possibly the book I was looking forward to reading the most, as I have previously read books by De La Cruz and enjoyed them. But oh man was this book a disappointment. The main character is horribly unlikeable and I did not feel like the two main characters were meant to be. My favorite part of this storyline was the gay best friend romance, which, unfortunately will likely be removed by Hallmark. Not only were the characters unlikeable, but so was the writing. I found it to be repetitive and superficial. One line even specifically said that she had to be careful because of her velour Manalo Blahniks. Ugh. All I can say is that I hope the adaptation is more enjoyable. Movie- The movie was much more enjoyable than the book, but that’s probably because the only things they kept the same were the names of the characters and the setting. The rest of the movie was very different. It was a Lacey Chabert movie an those are always solid, so I wasn’t surprised. I was also correct in that they switched her gay best friend out for a female character who only made a brief appearance. I will say that between the two, I mugh prefer the movie. Book- Now THIS is what I expected from a Christmas story. A Shoe Addict’s Christmas is an under 200 word novella. I have never read any of the books in the Shoe Addict’s series, but I think this story stands on its own. Noelle gets locked inside the department store that she works at on Christmas Eve. While there, Charlie, Noelle’s Fairy Godmother shoes up to use shoes to show Noelle what her life would be like if she hadn’t been too scared to take a chance. I enjoyed this story so much and am greatly looking forward to the movie adaptation. 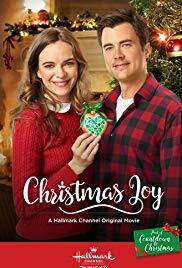 I’m curious to see how Hallmark ends up adding more romance to the movie, as in the book it’s a very minor plot point. Movie- I greatly enjoyed this movie! The movie stared Candice Cameron Bure and she was a delight. While the movie made a lot of changes from the book, the heart of the movie was still the same. Noelle still got locked inside the department store (although ever so briefly) and she still had Charlie sending her to memories with a nice pair of shoes. The differences were that the memories were a lot more recent and they also flashed to the future, and the love interest had a much greater part. In fact, he had an entirely separate story line which I loved. This book/movie pair was a win in my book! Book- This is the first book I which I watched the movie first and then read the book it was based on. I enjoyed the book, but it took me a little while to get through just because it moved slowly. It was different from the movie. In fact, there was an entire character and storyline that was removed from the book. The unfortunate part was that I really enjoyed the character and storyline that they removed. It was a nice Christmas story and I liked all of the characters. Movie- It’s a little harder to compare these two because I did see the movie first, so I think I compared a lot while I was reading. Like I mentioned above, the movie removed a good chunk, but overall it was very similar. I found Ben to be a little more likable in the movie than the book. Though he did have a bit of a hangup on city girls in the movie that he didn’t have in the book, and I did not miss it. I think this was another one where I preferred the movie to the book, but ever so slightly. Summary (Provided by Goodreads): Charlotte Gorman loves her job as an elementary school librarian, and is content to experience life through the pages of her books. Which couldn’t be more opposite from her identical twin sister. Ginny, an Instagram-famous beauty pageant contestant, has been chasing a crown since she was old enough to enunciate the words world peace, and she’s not giving up until she gets the title of Miss American Treasure. And Ginny’s refusing to do it alone this time. 100% this is a book I’d pick up based on the cover alone. The tagline describes this story for fans of Miss Congeniality as well as fans of Meg Cabot and Sophie Kinsella. Since Meg Cabot is one of my favorite authors and I have enjoyed the majority of Sophie Kinsella’s books, I even more wanted to pick the book up before even reading the description! I loved this book. From page one it grabbed my attention and I flew through the story. Charlotte and Ginny are identical twins, but Ginny is a pageant queen whereas Charlotte is an elementary school librarian more interested in touring Harry Potter World in her robes than walking down the runway in a formal gown. When Ginny has an allergic reaction that causes her face to swell, she begs Charlotte to take her place. This is the last year that she can take part in the competition that their deceased mother won in the 1970s. All Ginny needs is for Charlotte to make it through to the finals, where Ginny can take over. Charlotte agrees to step completely outside her comfort zone, but ends up learning more about herself and her sister than she ever thought possible. I relate to Charlotte on so many levels. She takes a trip to Orlando to support her sister in a beauty pageant, but truly goes so that she can spend the week laying by the pool, reading her stack of books, and visiting Harry Potter world. She is a homebody who much prefers to be in jeans and a t-shirt than dresses and bikinis. It was fun to watch her step into the world of beauty pageants and see that they are more than they’re cracked up to be. Wilson does a wonderful job at working the relationship between the sisters. The complexity of being identical twins and balancing the connection with being individuals was done so well. I also greatly enjoyed Charlottes growth throughout the novel. While there is a bit of a love story (which was so cute), her growth was not based around falling in love which I much appreciated. After finishing the book, I looked up to see what else Wilson has written (which is always the sign of a good book) and saw that she has written a few books that have been adapted into Hallmark movies! Now, unfortunately, I don’t know if this one would be picked up and turned into a Hallmark movie because it’s more of a sister story than a romance story, but I would love to see this book made into a movie. It’s a great balance of silly shenanigans and dealing with growing up and finding oneself. If you enjoy contemporary fiction I highly recommend this book. It’s a quick easy read that is the perfect balance of fluff and substance. Even though this book comes out in December, I think it would make for a great beach read. Although, if you’re someone who wants a quick read around the holidays that you can squeeze in between family functions, this might be a good choice! I’m also excited because I might have even found a new go-to author! I am looking forward to reading more books by Wilson and will even try to pick up her book Sleigh Bell Sweethearts which was adapted into a Hallmark Christmas movie this year! I recently happened to finish a handful of products that I really enjoyed around the same time, so I thought I’d do a quick round up of all of these empties. With the exception of the serum, they are all samples but they definitely deserve some love. The first product that I loved (which I already repurchased) is the Herbivore Coco Rose Body Polish ($36). This is a body scrub from a vegan and cruelty free company that I have been loving. I use it every time I shower and have noticed my skin feeling smoother and looking less red. It’s a little pricey, but it’s worth it. It’s just as expensive as the one from Lush that I want and a little bit easier for me to purchase, so definitely a win! The second product that was instant love for me is the M-61 Hydraboost Eye Serum ($72). I have never found an eye product that I’ve seen instant results from and this one gave me them. I immediately noticed the next day that my eye circles were lighter and my puffiness was less. In fact, I think I noticed the results even more when I skipped using the serum a few nights in a row. While this product is a little pricey, I can see myself purchasing this when I run out of other eye product samples that I have. Another product that I will keep in mind to purchase full size in the future is the Korres Greek Yogurt Foaming Clean Cleanser ($26). My face has loved this cleanser. I think that this is the longest my face has gone without a breakout in a while. I also love that it’s not scented. I definitely prefer cream cleansers because they keep my skin hydrated and the foaming aspect really makes you feel like your face is getting clean. While this product might seem simple, it really does the job. My fourth, and only full-size empty is the OSEA Hyaluronic Sea Serum ($88). I purchased this product a few months ago when I needed a new serum. It was recommended to me by an employee at Blue Mercury. I told her my main skin concerns and that I was looking for a cruelty free product and this is what she recommended. I did like this product when I was using it. Especially when I first started using it. However, when I started using a new serum after finishing this one, I noticed a lot of positive changes in my skin, so now I’m thinking maybe my skin didn’t love the OSEA as much as I originally thought? Either way, it was a good product, but I don’t think I’ll be repurchasing it as it is a bit pricey. The fifth and final empty is a sample of Marc Jacobs mascara ($26). I haven’t purchased a full size mascara in years because I feel like I always get mascara samples, however, because of this, my mascaras can be pretty hit or miss. This one was definitely a hit! It lengthed and gave volume without irritating my eyes. I can be sensitive to mascaras at times and had zero issues with this one. I’m a little bummed that I’m out of this mascara and hoping my next sample is just as good. Have you recently tried or finished any products that you’ve loved? Summary (Provided by Goodreads): Millie Morris has always been one of the guys. A UC Santa Barbara professor, she’s a female-serial-killer expert who’s quick with a deflection joke and terrible at getting personal. And she, just like her four best guy friends and fellow professors, is perma-single. Earlier this year I read Josh and Hazel’s Guide to Not Dating by Christina Lauren. It was my first book of theirs (review here) and I greatly enjoyed it. As soon as I saw this one, it was an automatic read, regardless of cover or summary. I was worried at first that this was going to be too similar to Josh and Hazel, but luckily it wasn’t. Millie and her four guy friends have decided to join a dating app together. One drunken night, she and Reid (her best friend of the bunch) end up sleeping together. They swear that their friendship isn’t going to change, but then they slowly realize they have feelings for one another. When Mille creates a second profile using her middle name to avoid creepers, she matches with Reid and decides to talk to him through the app. I really enjoyed the friendship between Millie, Reid, Alex, Chris, and Ed. They had some group text interactions that were fun and I liked how much they cared for each other. While this book was a bit predictable it was still enjoyable. Millie is emotionally unavailable, but finds that she can open up over text. I liked getting to learn a little more about Mille through these means. I also liked the relationship between Millie and Reid. It came off as a true friendship and I liked seeing how comfortable they were with one another. I thought that Millie’s emotional secrecy and Reid’s desire for her to open up more was going to be irritating, but it doesn’t go over the top. In all honesty, this book isn’t ground breaking and I don’t have much to say about it. I enjoyed the story and found it confirmed that Christina Lauren is (are?) an author that I will add to be automatic read list. If you like friendship to more romance stories, I would recommend this book. I wouldn’t have minded it being longer if I could have had some more of the group friendship interactions because I greatly enjoyed them. I also wouldn’t mind getting books about each of the friends and their romances.